Vancouver, BC (May 27, 2015) – A panel of Canada’s top chefs has spoken and announced the culinary finalists from Toronto’s regional heats of the national Hawksworth Young Chef Scholarship presented by TD Aeroplan Visa Infinite Privilege. 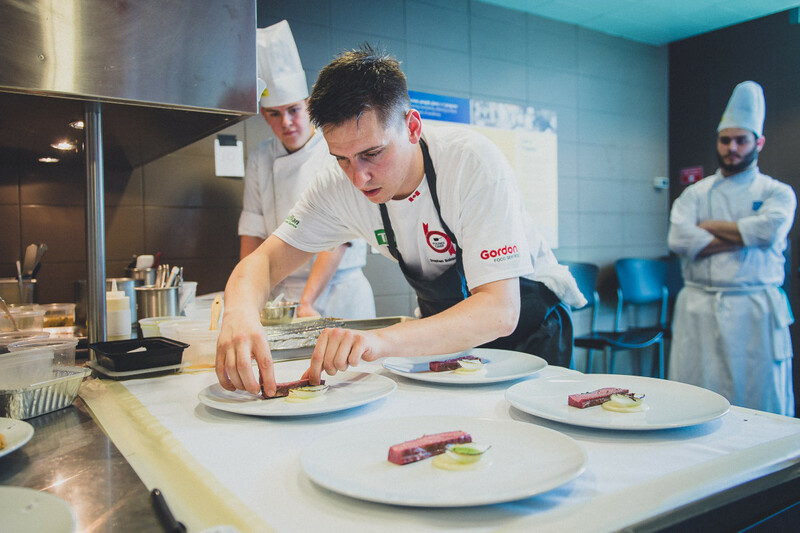 The competition was extremely fierce during the Toronto heat yesterday afternoon, with only two young chefs able to progress through to the final national round, which will take place on September 12 in Vancouver. Regional heats will also be held in Calgary, Vancouver and Montreal. Each competitor was given identical ingredients, provided by Gordon Food Service Canada, and allowed two hours in the kitchen to wow the taste buds of the judges. Those who came out on top were from a diverse group of talented young chefs from a number of the city’s top kitchens. The Toronto heat finalists are: Stephen Baidacoff (from Eleven Madison Park) and Marvin Palomo (from DaiLo) who stood out ahead of the competition to win over the judges. Stephen Baidacoff was first overall in the Toronto heat, impressing the panel of chefs, which included Rob Gentile, David Lee, Damon Campbell, Grant van Gameren, Kristian Eligh & David Hawksworth. The bold simplicity of his outstanding lamb dish showed a confidence that translated into an impressive first place showing. As a reward for his hard work in the kitchen, Le Creuset provided him with a Stainless Steel Chef’s Pan (Saucier) as well as round-trip airfare to Vancouver to take part in the final.